I know that the hd 15 and hd 50 will fit.was just wondering if there was more that would fit and maybe be better then these 2.
dls, STEVEGODSEYJR, cus_deluxe and 2 others like this. Cody what do you say to the nice man? president and cus_deluxe like this. That is making some serious assumptions!! He might have changed his named to Kaitlyn!!! And your post would/could be a "hate crime"!!! But either way, we need pics!!!!! FWANK WIZZO, Ketchup and dls like this. so which carb is best for my saws? I have 2 044s and 2 460s? Thank you Ozhoo. Looking at the diagram, I would think the independent would be best but readying how they work, I think the dependent is the best. Very interesting how the placement of 2 holes make the difference. Thanks again. Cheers. Thank you Ozhoo. Looking at the diagram, I would think the independent would be best but reading how they work, I think the dependent is the best. Very interesting how the placement of 2 holes make the difference. Thanks again. Cheers. All also say Stihl on them. I’ll give you the quick and dirty I’ve learned, although it isn’t as comprehensive as what’s above. All HD carbs, exc the 361 carb and the 461 carb will physically fit. The 361 carb has no impulse barb, it’s on the face of the carb. It also has a smaller bore. A different choke rod. The 461 carb is reported to have a different midrange circuit. I can’t confirm this. I’ve visually seen a #58 and also a #70 jet on different HD50 carbs. They have an impulse barb but need the choke rod swapped or the control switch from a 461 swapped in to have choke function on the older 1128. I personally haven’t noticed any huge performance increase using it on a 44o/460/446. The rest of them all fit, all have the same Venturi and bore size, but have different main jets. The main jet is removable and easily modified with a micro drill. @ri chevy has a nice little chart he wrote up on bore sizes and factory jetting. In general, if you need your H needle out more than 1.5 turns for the saw to run in tune, consider drilling the main. The Zama have individually controlled Idle circuits. They run well and touching the L doesn’t affect the H tune. On the HD Walbro, adjusting the L will actually affect the H tune a bit. I’m sure I missed something or there is a caveat that exists. ri chevy and TRTermite like this. It’s a 5 minute job to make any jetted like an 8 or an 11. 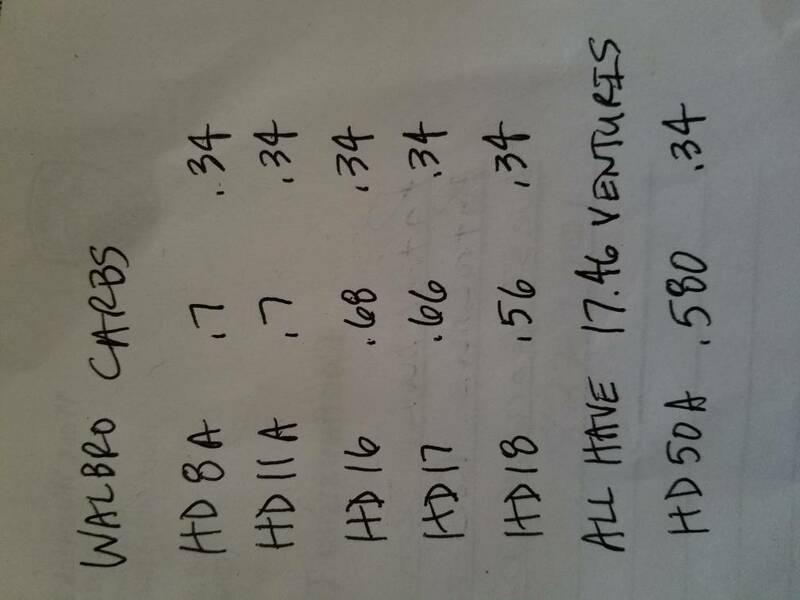 I’ll add that the HD14 is .7 also.